Model:TPC552201 ARCA MM BALL PEN Description: A twist action plastic pen with a metal nose cone and clip. Both plastic parts can be supplied in the colour blocks to the right. Black or Blue ink. Colour Options: Product Data Specification Product Size 141 x 8 mm dia Product Weight Ink Colours If Applicable Black,Blue Additional Information Price includes 1 colour print to 1 position only. Set up and carriage are additional. Lead Times 4 weeks from artwork approval Personalisation Data Max Personalisation Pad/Screen Print Area 40 x 20 mm (barrel), 35 x 6 mm (clip) Engraving Area Full Colour Area Embroided Area Max Spot Colours N/A Foil Block Embossing N/A Notes Price includes a 1 colour print to 1 position. Set up and carriage are additional. 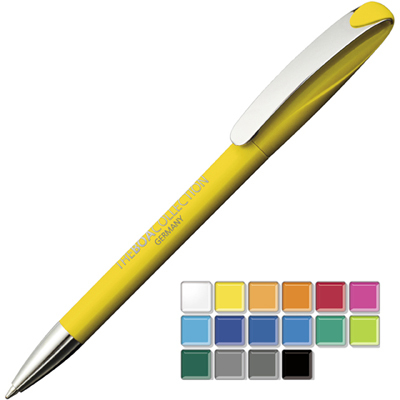 Model:TPC552202 ARCA MMT BALL PEN Description: Twist action plastic pen with a metal nose cone and clip. Both plastic parts can be supplied in the colour blocks to the right. Black or Blue ink. Colour Options: Product Data Specification Product Size 141 x 8 mm dia Product Weight Ink Colours If Applicable Black,Blue Additional Information Price includes 1 colour print to 1 position only. Set up and carriage are additional. Lead Times 4 weeks from artwork approval Personalisation Data Max Personalisation Pad/Screen Print Area 40 x 20 mm (barrel), 35 x 6 mm (clip) Engraving Area Full Colour Area Embroided Area Max Spot Colours N/A Foil Block Embossing N/A Notes Price includes a 1 colour print to 1 position. Set up and carriage are additional. Model:TPC551905 BOA BALL PEN Description: A solid twist action plastic pen with a plastic nose cone and clip. All plastic parts can be supplied in the colour blocks to the right. Black or Blue ink. Colour Options: Product Data Specification Product Size 144 x 8 mm dia Product Weight Ink Colours If Applicable Black,Blue Additional Information Price includes 1 colour print to 1 position only. Set up and carriage are additional. Lead Times 4 weeks from artwork approval Personalisation Data Max Personalisation Pad/Screen Print Area 40 x 20 mm (barrel) 35 x 6 mm (clip) Engraving Area Full Colour Area Embroided Area Max Spot Colours N/A Foil Block Embossing N/A Notes Price includes a 1 colour print to 1 position. Set up and carriage are additional. 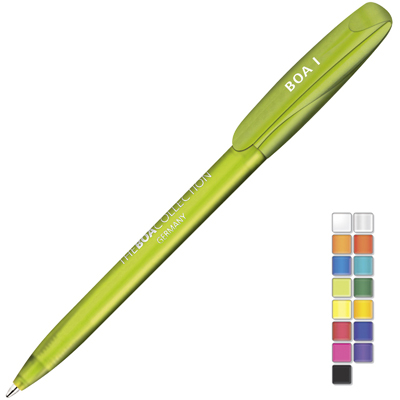 Model:TPC551904 BOA ICE BALL PEN Description: A twist action frost plastic pen. Both parts can be supplied in the colour blocks to the right. Black or Blue ink. Colour Options: Product Data Specification Product Size 141 x 8 mm dia. Product Weight Ink Colours If Applicable Blue, Black Additional Information Price includes 1 colour print to 1 position only. Set up and carriage are additional. Lead Times 4 weeks from artwork approval Personalisation Data Max Personalisation Pad/Screen Print Area 40 x 20 mm (barrel), 35 x 6 mm (clip) Engraving Area N/A Full Colour Area N/A Embroided Area N/A Max Spot Colours N/A Foil Block Embossing N/A Notes Price includes 1 colour print to 1 position only. Set up and carriage are additional. Model:TPC551903 BOA M BALL PEN Description: A solid twist action plastic pen with a metal chrome nose cone. Both parts can be supplied in the colour blocks to the right. Black or Blue ink. Colour Options: Product Data Specification Product Size 144 x 8 mm dia. Product Weight Ink Colours If Applicable Blue, Black Additional Information Price includes 1 colour print to 1 position only. Set up and carriage are additional. Lead Times 4 weeks from artwork approval Personalisation Data Max Personalisation Pad/Screen Print Area 40 x 20 mm (barrel), 35 x 6 mm (clip) Engraving Area N/A Full Colour Area N/A Embroided Area N/A Max Spot Colours N/A Foil Block Embossing N/A Notes Price includes 1 colour print to 1 position only. Set up and carriage are additional. Model:TPC551901 BOA M ICE BALL PEN Description: A frost twist action plastic pen with a satin metal nose cone. Both parts can be supplied in the colour blocks to the right. Black or Blue ink. Colour Options: Product Data Specification Product Size 144 x 8 mm dia. Product Weight Ink Colours If Applicable Blue, Black Additional Information Price includes 1 colour print to 1 position only. Set up and carriage are additional. Lead Times 4 weeks from artwork approval Personalisation Data Max Personalisation Pad/Screen Print Area 40 x 20 mm (barrel), 35 x 6 mm (clip) Engraving Area N/A Full Colour Area N/A Embroided Area N/A Max Spot Colours N/A Foil Block Embossing N/A Notes Price includes 1 colour print to 1 position only. Set up and carriage are additional. Model:TPC551902 BOA M ICE BALL PEN Description: A translucent twist action plastic pen with a metal chrome nose cone. Both parts can be supplied in the colour blocks to the right. Black or Blue ink. Colour Options: Product Data Specification Product Size 144 x 8 mm dia Product Weight Ink Colours If Applicable Black,Blue Additional Information Price includes 1 colour print to 1 position only. Set up and carriage are additional. Lead Times 4 weeks from artwork approval Personalisation Data Max Personalisation Pad/Screen Print Area 40 x 20 mm (barrel) 35 x 6 mm (clip) Engraving Area Full Colour Area Embroided Area Max Spot Colours N/A Foil Block Embossing N/A Notes Price includes a 1 colour print to 1 position. Set up and carriage are additional. 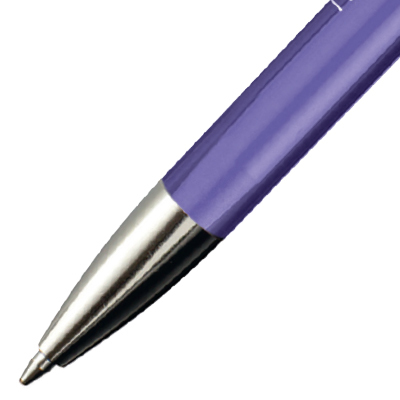 Model:TPC551907 BOA MM BALL PEN Description: A solid twist action plastic pen with satin metal nose cone and clip. All plastic parts can be supplied in the colour blocks to the right. Black or Blue ink. Colour Options: Product Data Specification Product Size 144 x 8 mm dia Product Weight Ink Colours If Applicable Black,Blue Additional Information Price includes 1 colour print to 1 position only. Set up and carriage are additional. Lead Times 4 weeks from artwork approval Personalisation Data Max Personalisation Pad/Screen Print Area 40 x 20 mm (barrel) 30 x 6 mm (clip) Engraving Area Full Colour Area Embroided Area Max Spot Colours N/A Foil Block Embossing N/A Notes Price includes a 1 colour print to 1 position. Set up and carriage are additional. 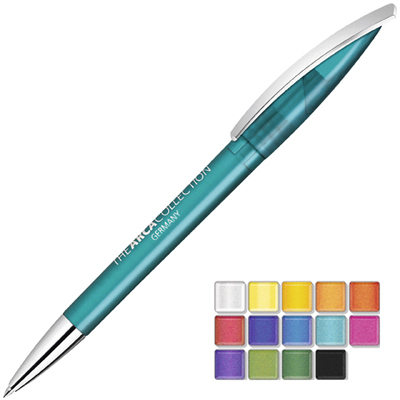 Model:TPC551909 BOA MM ICE BALL PEN Description: A frost twist action plastic pen with a satin metal nose cone and clip. Both parts can be supplied in the colour blocks to the right. Black or Blue ink. Colour Options: Product Data Specification Product Size 144 x 8 mm dia Product Weight Ink Colours If Applicable Black,Blue Additional Information Price includes 1 colour print to 1 position only. Set up and carriage are additional. Lead Times 4 weeks from artwork approval Personalisation Data Max Personalisation Pad/Screen Print Area 40 x 20 mm (barrel) 30 x 6 mm (clip) Engraving Area Full Colour Area Embroided Area Max Spot Colours N/A Foil Block Embossing N/A Notes Price includes a 1 colour print to 1 position. Set up and carriage are additional. 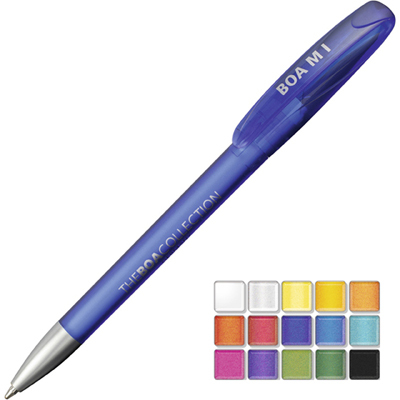 Model:TPC551908 BOA MMT BALL PEN Description: A transparent twist action plastic pen with a metal nose cone and clip. Both parts can be supplied in the colour blocks to the right. Black or Blue ink. Colour Options: Product Data Specification Product Size 144 x 8 mm dia. Product Weight Ink Colours If Applicable Blue, Black Additional Information Price includes 1 colour print to 1 position only. Set up and carriage are additional. Lead Times 4 weeks from artwork approval Personalisation Data Max Personalisation Pad/Screen Print Area 40 x 20 mm (barrel), 30 x 6 mm (clip) Engraving Area N/A Full Colour Area N/A Embroided Area N/A Max Spot Colours N/A Foil Block Embossing N/A Notes Price includes 1 colour print to 1 position only. Set up and carriage are additional.